You click your seat belt when getting behind the wheel and make sure child seats are securely fastened – but do you give the same attention to items you're hauling? Unsecure loads can be deadly, yet we still regularly see items from trash to large pieces of wood or metal flying out of the back of vehicles on roadways. Last year, the Washington State Patrol contacted 6,268 vehicles for failing to secure their load and at least 170 collisions were caused by unsecure loads. Of those, 16 involved injuries. Nationally, more than 200,000 crashes between 2011 and 2014 were caused by road debris, according to a recent study by the AAA Foundation for Safety, including 39,000 injuries and 500 deaths. Seattle's Robin Abel knows the dangers all too well. In 2004, her daughter was seriously injured by road debris on Interstate 405. The experience made Abel a safety crusader. She's since lobbied state and federal officials and this year 47 states and the U.S. Virgin Islands will officially recognize June 6 as Secure Your Load Day, vowing to educate the public on the importance of safely securing loads. "Unsecured loads and road debris are not freak accidents but frequent incidents and most are preventable with just a few minutes of time and a few dollars in equipment," Abel said. This Washington State Patrol photo from a 2016 unsecure load crash on State Route 97 shows just how dangerous items can be when they crash into oncoming vehicles. The driver of this car was sent to the hospital but survived. It's not just large items either. Even a hammer or shovel thrown in the back of a pick-up truck can turn dangerous once it's suddenly hurtling toward other travelers. "A 20-pound object at 55 mph has a force of 1,000 pounds at impact," Abel said. Abel worked for tougher laws for those who violate the secure load laws in Washington and elsewhere – making it expensive as well as dangerous to drive with unsecure loads. In our state, fines now range from a $228 citation to criminal charges if items cause property damage or injuries. In addition to the danger, unsecure loads also are a major culprit in roadside trash along our highways. We spend $4 million a year on roadway cleanup and have an active Adopt-A-Highway program and the Department of Ecology Youth Corps program assisting with trash clean up. Despite those efforts, the amount of trash on roadways continues to grow. Even a "quick trip" to a landfill or helping a friend move requires tying down or otherwise securing the items. "Secure Your Load as if everyone you love is driving in the car behind you," Abel said. Because, after all, someone's loved ones are. 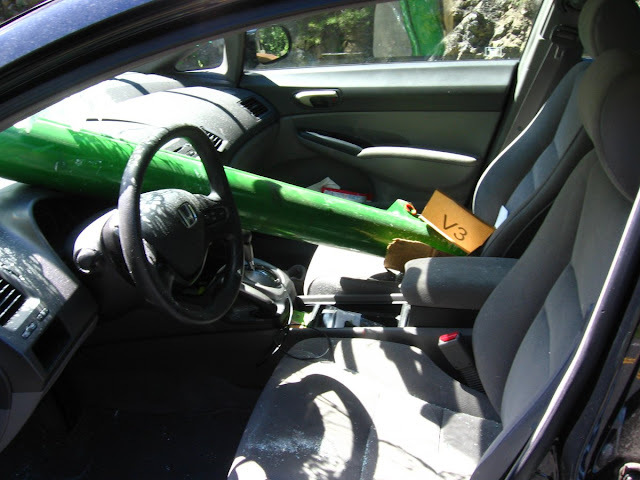 The hydraulic cylinder lift arm that came off another vehicle crashed through the windshield of this car in 2016, narrowly missing the driver.